Opening weekend was good to us here at RMSGear. Danny, my brother-in-law Kelly, and I got out to hunt with our cousin Chad in Nebraska. We drove out with long time friend, and one time RMSGear employee Andy Thomas. Andy has a real job now and only shoots his bow about four times in an average year, once at a turkey, once at an elk, and a few times at deer. You'll see how that works out for him below! I wish I had his talent, the man is a killer. As you can see in the picture above, there was a large group of turkeys roosted in a powerline a couple hundred yards from the field edge we were sitting on. This is typically a bad sign for the morning hunt. The turkeys will usually stay in the hills and not come down into our field. They also pull a lot of turkeys from our field before they make it to us. On this particular morning that is exactly what happened, luckily there were enough turkeys that we were still able to pull in a few gobblers. We've hunted this field for quite a few years now so we have a good feel for which direction the turkeys travel. This time of year we typically try to position ourselves in travel corridors early in the morning. If the turkeys are already headed our direction, and they are going to pass by within 100 yards, then we have luck calling them in. But if they are not already coming towards us it is very hard to change their course. Only after the turkeys are "done" for the morning with their feeding and strutting have we had better luck calling in toms. Every group of hens had a tom or two with them and those toms were completely uninterested in our calling/decoys. One hen in particular was quite vocal. Just for fun I decided to mimic her. Every time she called I would call back with the same tone and cadence. That piqued her curiosity and she came right towards us, a big tom followed just a few steps behind her. The hen walked right up to our decoys and gave them a good look. The tom followed as well, at one point only a few steps from our blind. I waited for him to walk into one of the blind windows for a five yard shot, but he angled away from us as the hen lost interest in our decoys. I was sitting in the blind with Kelly. We had to do some major improvising with the windows to get a shot at this turkey before he was out of our lives. Kelly dropped the window that he was sitting by as I tried to position myself to shoot out that side of the blind. Kelly couldn't get out of my way. As I drew I had to make sure that my limb wasn't going to hit the blind, hit Kelly, or hit Kelly's bow. At full draw I noticed my bow quiver basically resting on Kelly's shoulder. I figured I would be fine, so I started focusing my attention on the strutting gobbler, who was now facing us at 15 yards or so. 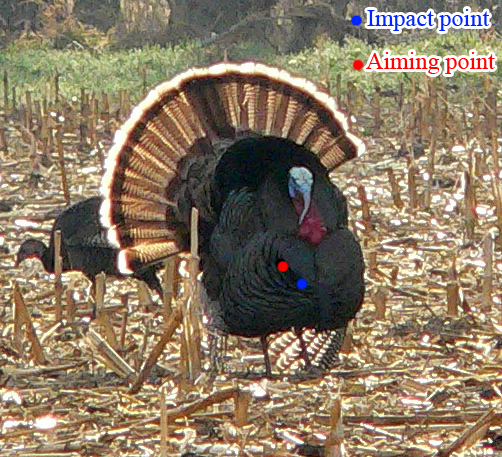 In the picture below you can see in blue where I actually hit the turkey, and in red where I was aiming. I'm a firm believer in aiming at an imaginary intersection drawn directly up from the turkey's legs, and horizontal to the middle of his body. library that shows the body position of the turkey I shot. My shot was only inches from my aiming point. I could see that I took out the turkeys far leg and felt completely confident that he would die in a very short amount of time. He hobbled off the field and laid in some trees lining a creek we were sitting near. 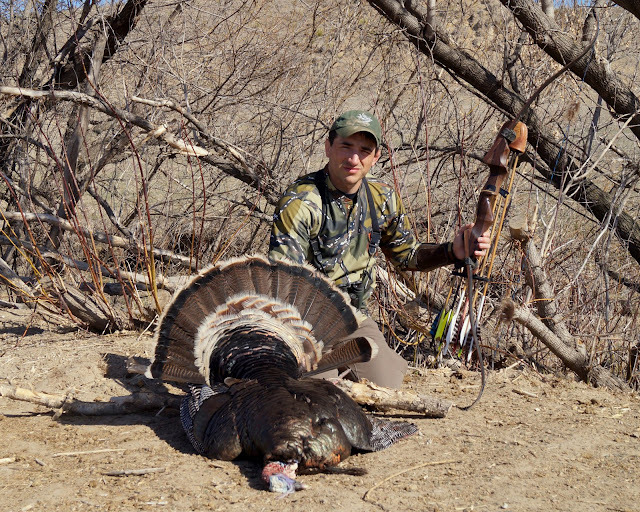 We hung tight in our blind, flung a few more arrows (none connected), and got out a few hours later to retrieve my turkey. To my surprise he was still alive, but very weak. I simply cannot believe how tough these birds can be. My arrow entered a few inches to the right of his beard, and exited through his left thigh. Danny was about 1/2 mile away in a blind with Chad. He can pull back his compound once every few hours, still recovering from a shoulder surgery he had after deer season. One shot was all he needed to kill this jake. Danny is about sick and tired of shooting wheels and cannot wait to get his recurve back in his hands. Andy appeared to be in the best spot from what I could tell, but somehow all the turkeys skirted him by 50 yards or so. Late in the morning he threw a few loud yelps at a gobbler across the field. That tom sprinted across the field but hung up at 35 yards. Andy, who hasn't shot an arrow in months, let one go from his Morrison recurve at 35 yards. He couldn't have placed it any more perfect than he did, and his bird was dead within seconds. I returned for a follow up trip the following weekend, but a tornado spoiled our plans. Thankfully this massive tornado missed us by about a mile. The storm that brought this tornado turned into a blowing snow storm overnight, with 15 degree temps and 40mph wind gusts. The hunt was a bust, but I still had a blast with a few good friends. 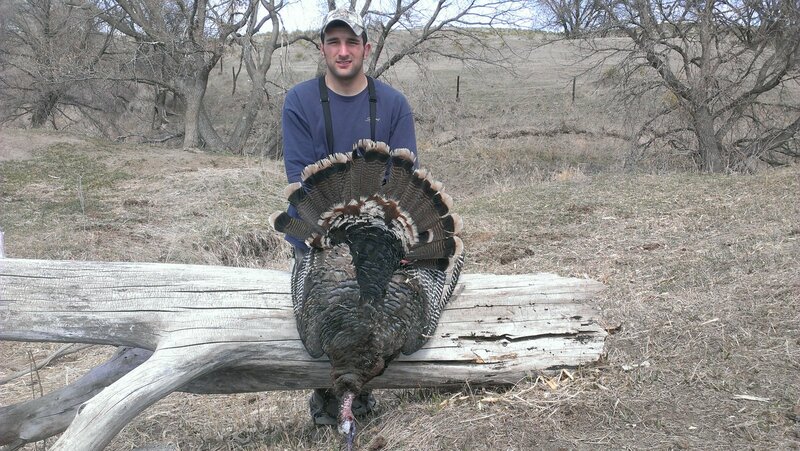 More turkey hunting stories to follow! You guys got some decent weather over there. If it ever stops snowing here, I might have a chance at a thunder chicken.